Albert Lee Martin, Jr. age 67, of Monmouth, Illinois; passed away at 4:59 am on Saturday November 24, 2018 at his Monmouth residence. Albert was born on May 9, 1951 in Denver, Colorado and is the son of Albert Lee and Pauline Grace Winsor Martin, Sr. Albert was raised and educated in many places that his family lived, moving frequently. He attended Monmouth High School. After school, Albert proudly served his country as he served in the Army and was listed as 1st Class. ??? Albert married Winifred Kay Rickettes on November 15, 1975 in Monmouth, Illinois. She preceded his in death on June 23, 2009. He and she renewed their vows just prior to her death in 2009. Albert began work as a farm hand in several different farms, he also worked on the flood of 1965 in Ft. Morgan, Colorado. Locally Albert was employed at Western Stoneware of Monmouth for a time, then later worked at Maytag in Galesburg for a time. In Monmouth he was delivery person for Fred Beard and the Monmouth News Agency for a number years. He lastly was employed by Eddie Craig and the Monmouth Bowling Lanes from 1969 to 1982. 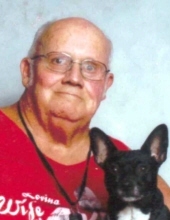 Albert enjoyed collecting odds and ends and enjoyed people, family, and loved his dog "Coco". He is survived by his daughter, Ann Martin (Brian Asmus, Jr. of Monmouth, Illinois and his son, Albert L. Martin III of Alexis, Illinois. There are three grandchildren, Ashley, Brian, and Tammy and two great grandchildren. Four sisters survive, Ruth Gonzales (Trinidad) of Galesburg, Illinois, Margaret Martin and Amber Taylor, both of Monmouth, Illinois, and Alberta Fairbanks of Minnesota. There are four surviving brothers, Tony Martin (Rosemary) and William Martin both of Monmouth, Illinois, Michael Martin of Burlington, Iowa, and Ronny Martin in Minnesota. Also a number nieces and nephews are surviving. Albert is preceded in his death by his parents, wife, two sisters, and one brother. To send flowers or a remembrance gift to the family of Albert Lee Martin, Jr, please visit our Tribute Store. "Email Address" would like to share the life celebration of Albert Lee Martin, Jr. Click on the "link" to go to share a favorite memory or leave a condolence message for the family.